The designers and builders of the Forest Ranger are unknown. However, it is clear that the vehicle was designed specifically for combat on forested worlds, though it is quite effective on other types of terrain. The disc-shaped cockpit is controlled with gyroscopic movements and sensors to help the craft remain stable during travel. The Forest Ranger is heavy and sturdy enough to advance over trees, yet light enough to still remain maneuverable within a forest. Moderately fast and equipped with two sets of blasters, the Forest Ranger is a formidable foe in combat. The two medium blasters are offset to the left and right at the rear of the vehicle and the light blasters are mounted on the leading edge of the large disc. The sensor array is limited, but powerful enough to scan through heavy foliage and trees. 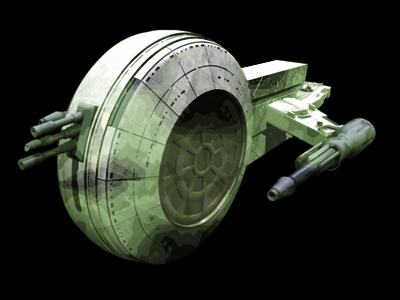 The Forest Ranger is well equipped and suited for use by mercenaries, security forces and armies throughout the galaxy.